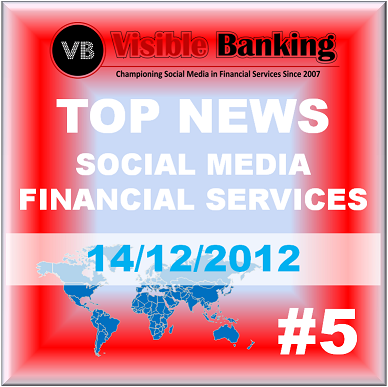 6 Top Daily News on Social Media in Financial Services (14 December 2012): bank Execs and social reputation management, P2P payments on twitter, social customer service. This is our selection for Friday 14th December 2012. Please flag any missing major news and share your comments here on our blog, or via twitter (@Visible_Banking). Thousands of children in Florida are suffering from chronic or critical diseases and they need a break from that. Making sure it happens, the Security First Insurance Company launched a holiday Facebook campaign, help children forget their illness, on 12th December 2012, pledging to donate $5,000 to help these children attend the Camp Boggy Creek and help them forget their illness. Social media influences the operation of businesses as well as their success. Investec Bank‘s managing director suggested that boards are not ready to fully engage in social media unless they have someone who has both business intellect and technology skills. Also, engaging customers, employees, and stakeholders with new online tools can be a weapon of destruction. The Bank of Queensland seeks to use social media and other online engagement forms to serve their customers. The bank intends to use its top strategy, multi-channel optimisation, to serve customers through their own preference. The bank also wants to be a more dexterous competitor by fixing the technology behind its internal processes. The De Moines, Iowa start up has a new way of sending money – by tweeting. If you are one of those that complains about how troublesome logging into the Dwolla app, the company introduced a feature that ties a Dwolla account to a Twitter account. In order to help small businesses obtain credit through high-street banks, business secretary Vince Cable, pledged £55 million to peer-to-peer lenders and other finance suppliers via the Business Finance Partnership. This new announcement will help the new Business Bank, which will start its operation on 2014, tackle long-standing structural gaps in the finance supply of SMEs. Synthetix conducted a research among 500 UK and US consumers to determine their opinion about self-service being a channel of choice. The survey revealed that most people feel loyal to a company when consumer service is done well. Most consumers prefer to self-serve answers to the questions through emails and calls, asking companies to pay attention and keep their multi-channel experience consistent.